I mentioned in my post Fasting and Feasting for All Hallows' Eve, All Saints' Day and All Souls' Day that "I had also hoped to make Sugar-Candy Skulls this year, but unfortunately I never got around to ordering the supplies." 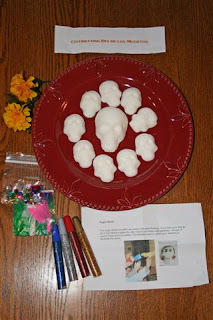 Well, I was so surprised when a box arrived in the mail, just a few days later, filled with ready made Sugar Skulls and all the supplies we would need to decorate them! They were sent from Mary at Our Domestic Church, who I have so enjoyed getting to know through blogging. Rascal made the one with the orange feather and told me that he was a Viking. "That's why he has a helmet on." They did a great job of decorating. I'm so glad they enjoyed it!